SIMONE ALIPRANDI BLOG: A Europen Creative Commons license? In my opinion having a European version of the Creative Commons licenses would be useful. In fact, we know that in the last years copyright law in Europe has been reformed mainly thanks to the intervention of UE/CE Directives. 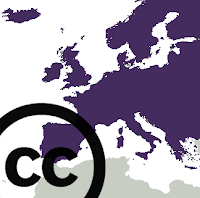 So why do not we think about a CC license porting based on the common legal principles of all the European countries? Many european authors are active not strictly in a specific country but in all the European context; them can certainly use that license for their works. It is not so difficult to do: we can take the existing "unported version" and adapt it to the principles of the UE/CE directives (with attention to the tricky problem of database rights), leaving generic statements about the applicable law. The porting and updating work can be managed by a european coordinated group, while the national (already existing) working groups would simply prepare an additional text with caluses related to the national law. That additional text can be added to the licenses when the published work would of course "live" within specific boundaries. Obviously, this is just an idea and it should be better examined. But it can be a begin for getting opinions and comments.